Made From Two Piano Boxes. Is Practical, Comfortable and Inexpensive. 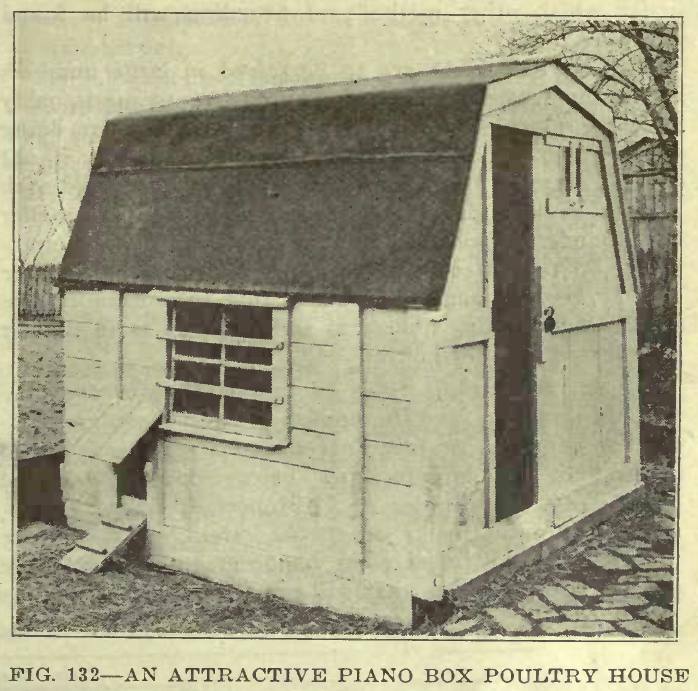 Inexpensive poultry houses may readily be made from piano boxes. 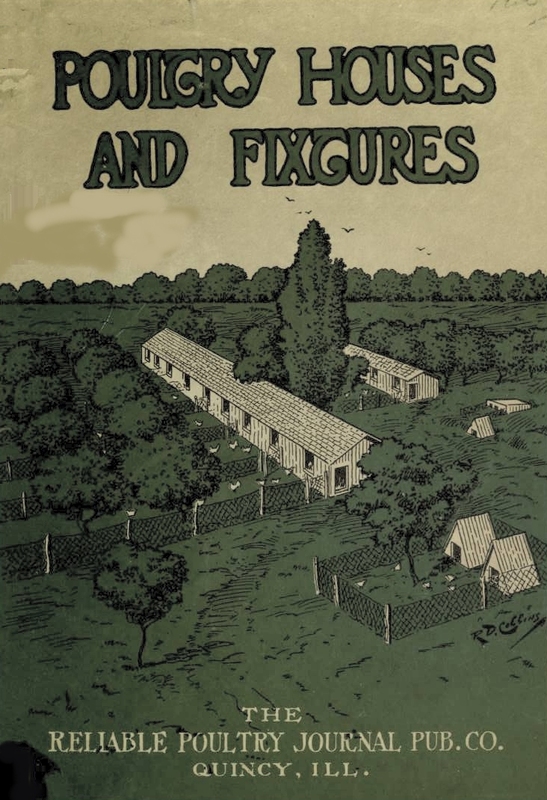 The substantial one shown in Fig. 132 above is a good example of a house of this type, and it can be built with comparatively little work. In the days before radio people stood around the piano and made their own entertainment, which meant a lot of pianos. 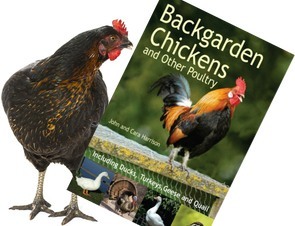 They had to be delivered in boxes and the boxes became the raw material to build chicken coops! Although we don’t see many plywood piano boxes around, it goes to show what can be done with cheap, recycled materials and some ingenuity. A lot of plywood is used as temporary shuttering in building projects. Most often they’re happy to have it removed without charge. It is made by removing the backs and tops of two piano boxes and placing them together, back to back, on a substantial foundation. Two pieces, 6 inches wide and 20 inches long, are fastened to the top of both boxes, to give pitch to the roof. The two boxes are to be fastened together with upright strips, 4 inches wide and 4 feet 6 inches long. If it is desired to make the house portable, use screws instead of nails for the purpose. A door 4 feet 6 inches high and 16 inches wide is cut out of the end of one of the boxes and a yard door for the fowls near one corner. Nail a 2 or 3-inch strip around the edge of the roof to give a projection and then nail on the roof boards and cover them with prepared roofing. The window in the front of the building contains four 8 x lO-inch panes of glass and there is a ventilating opening in the gable provided with an 8 x lO-inch pane, which slides in suitable grooves, providing additional ventilation when required. The bars across the window are made from old buggy tires and are a desirable addition where there is danger of the fowls being molested by thieves. In this house the perch is located along the wall, opposite the window, and a suitable droppings board about 2 feet wide should be provided. The nests may be cheaply made and may be suspended from the front edge to the droppings board, which should be high enough to allow the fowls the free use of the entire floor. There will be sufficient lumber from the backs of the boxes to make the droppings board, window cases and a little screen over the exit door, etc. 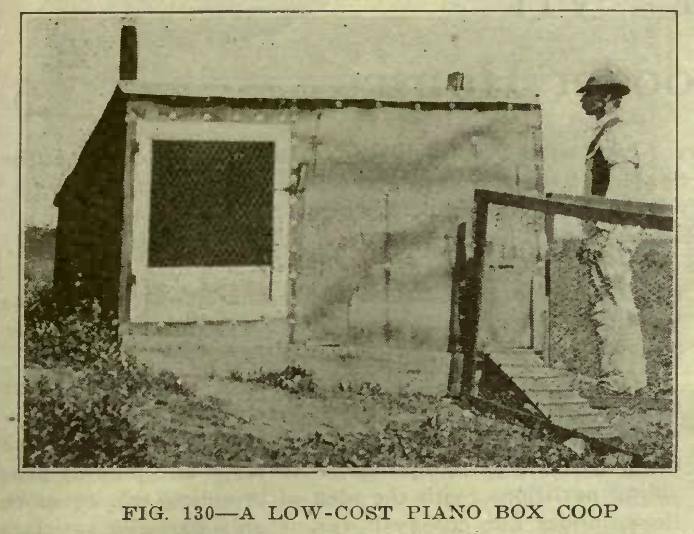 The only materials required in building this house, aside from the two piano boxes, are the window glass, roofing, one pair of hinges, one hasp and a little paint. The house shown in Fig. 130 has a floor space of approximately 30 square feet and was made from a single piano box. The back of the box forms the floor. The front was removed and the sides filled in on the line of the slope of the top part of the front, thus giving a plain shed roof. The roof boards were nailed to battens and hinged at the front so that the entire roof could be raised for cleaning, etc. In the ordinary care of fowls, access to the interior is secured through the 21/2 x 3-ft. opening, which is protected with double screens, one covered with netting and the other with muslin. 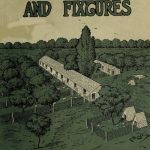 It was filled with poultry house plans and layouts for small farms and back yard enterprises, many of which had been produced by universities and the US department of agriculture.